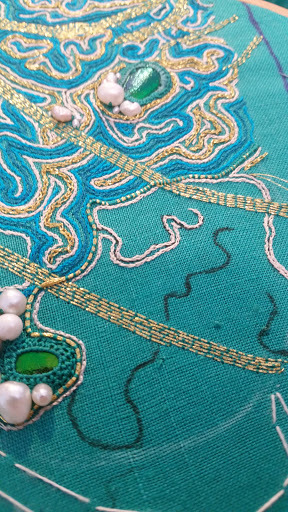 Well, I'm at the point in this project where I'm couching down 8 to 10 strands of gold thread at a time. I'm using this to evoke mermaid's hair, so there will be strands of this throughout the piece. I'm using a thread that is very very close to the background fabric color, that way it will be as if the hair appears and disappears. I think it's a nice effect, and it casts a good shadow. I'm not entirely comfortable being outgoing on the internet yet, but I hope other folks can use the way I work as a jump off point for their own creative endeavors. We all see further by standing on the shoulders of giants, or even each other. It's a way to support the next generation of artists and craftspeople. So, please, feel free to stand on my shoulders and see what you can make.